Check out Touch and Go on Amazon. 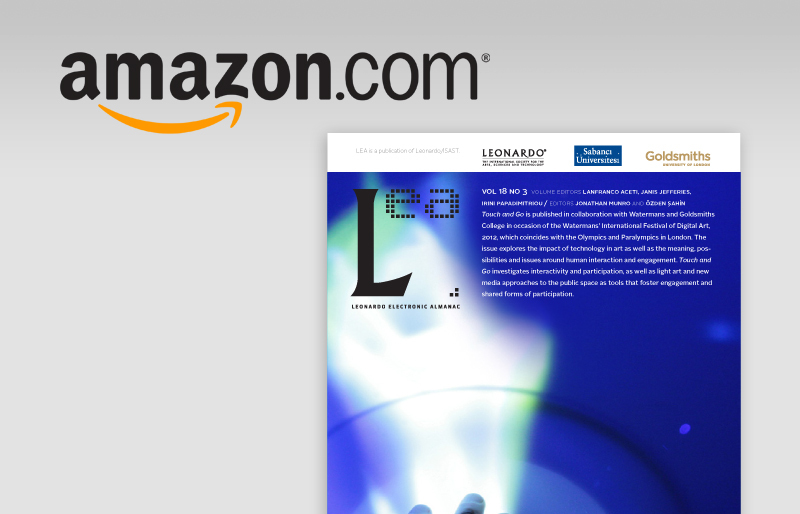 Leonardo Electronic Almanac (LEA) in collaboration with Watermans and Goldsmiths University of London in occasion of the 2012 Watermans’ International Festival of Digital Art is pleased to announce Touch and Go, a new LEA special issue available on Amazon. The Watermans’ International Festival of Digital Art, 2012, coincided with the Olympics and Paralympics in London, hosting a series of ground-breaking installations and exploring the impact of technology in art as well as the meaning, boundaries and issues of interaction and participation. This special edition of LEA is the result of discussions and themes explored during the year-long seminars and Festival at Watermans in collaboration with Goldsmiths University of London. The themes include audience engagement, new media geographies, digital art and illusion, gesture and art in virtual reality. Touch and Go analyzes the role that interactivity and participation – as well as light art and new media approaches to the public space – play as tools that may foster engagement and shared forms of participation. Contemporary art is pursuing technological modes of interaction and display that provide the audience with media rich experiences. But are these forms of interaction, interpassive pre-ordained engagements or new technologically based forms of entertainment? Or is art redefining further its relationship with the audience – following and pushing forward the experiential examples of Christo and Spencer Tunick through the aid of technology? This special issue of LEA presents artworks that explore and analyze the relationship between these different aspects that contribute to the complexity – conceptual, technological and aesthetic – of interactive installation in public space, creating the ground-breaking and complex phenomena that characterize the aesthetics and visuality of contemporary technocultures. Artists and Writers Featured: Suguro Goto, Tine Bech, One-Room Shack Collective, Michele Barker & Anna Munster, Eleanor Dare, Carol MacGillivray and Bruno Mathez, Phoebe Hui, Gail Pearce, Graeme Crowley, Joseph Farbrook, Rui Felipe Antunes, Felicie d’Estienne d’Orves, Birgitta Capplelen and Anders-Petter Anderson, Scenocosme, Dave Colangelo and Patricio Davila, Marco Donnarumma, Friederichs-Büttner and Benjamin Walther-Franks, Judson Wright, Maria X, Ellen Pearlman, Newman Lau & Kenny Lozowski, Charissa N. Terranova.